When I need a ride, I no longer call a dispatcher. Rather, I call a driver directly, using a service like Lyft or Uber. When I want to watch a TV show, I no longer tune in to a local TV station and wait for them to show it. Instead, I just stream it to my computer. In short, I’ve eliminated the middleman. The process is called disintermediation – I’ve eliminated the intermediary. We see it happening in publishing, lodging, ride sharing, television, even in adultery. Traditionally, banks are trusted intermediaries that allow us to conduct business with strangers. You buy something from me and I want to be paid. You give me some token of value. Can I trust you? Maybe not. So I turn to the banking system. Your bank can verify that you have the necessary funds on deposit. My bank can verify that your bank will actually transfer those funds to my account. It’s a valuable service and banks charge a significant fee for it. As intermediaries, banks are subject to disintermediation. If we can eliminate them, we can create a simpler, cheaper, more efficient system. That’s the promise of Bitcoin, which uses an encrypted blockchain to enforce trust through software. To date, Bitcoin’s fans include hipsters, drug dealers, terrorists, and libertarians — people who prefer anonymity and cash rather than credit. The fan club has given Bitcoin a seedy reputation. Mainstream financial institutions might well ask, With friends like those, who needs Bitcoin? The short answer is: Anyone who can’t access a trustworthy banking system. As Jeremy Millar points out, that includes much of the third world. If you’re trying to run a business in, say, Greece or Argentina, you’ll encounter an array of financial obstacles, including currency controls and cross-border payment limitations. 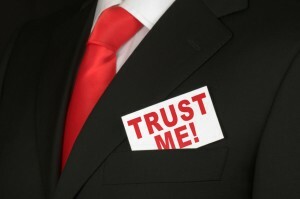 Your suppliers can’t trust that you will pay them promptly. Nor can you trust that your customers will. Since the banking system can’t supply a trusted intermediary, you turn to Bitcoin. According to Millar, Bitcoin will find a niche in the third world and expand from there. (If so, Bitcoin will closely follow Clayton Christensen’s model of disruptive innovation: 1) find a niche; 2) mature; 3) disrupt). And who else might need Bitcoin? Well, the banks themselves. Bankers realize that they are likely to be disrupted. So why not disrupt themselves rather than waiting for someone else to do it for them? That appears to be exactly what a Wall Street startup named R3 is planning to do. R3 doesn’t use Bitcoin per se but rather the cryptographic technology that underpins Bitcoin. In addition to the blockchain that identifies transactions, R3’s system uses distributed ledgers in a peer-to-peer (P2P) network. The system consists of many nodes that replicate information. (It’s similar to Napster). Since information is distributed across many nodes, there is no single point of failure. Since the nodes can be scattered around the world, no single government can control it. Since transactions are copied to multiple nodes, it’s also very hard to cook the books. The system builds trust through replication and encryption. According to its latest press release, R3 has now signed up 42 major financial institutions. The list includes some very heavy hitters, including Banco Santander, Deutsche Bank, J.P. Morgan, Goldman Sachs, HSBC, Royal Bank of Canada, and SEB. The consortium is now building a technology platform that will allow members (and presumably non-members) to build global applications. In essence, R3 plans to bring us a version of Bitcoin run by professional financiers rather than wild-eyed technology radicals. That’s not such a bad idea. But there’s also a darker side. If R3-like platforms succeed, the world’s financial system will be controlled by bankers rather than by governments. So we come back to a question of trust. Whom do you trust to run the global financial system: bankers or governments?